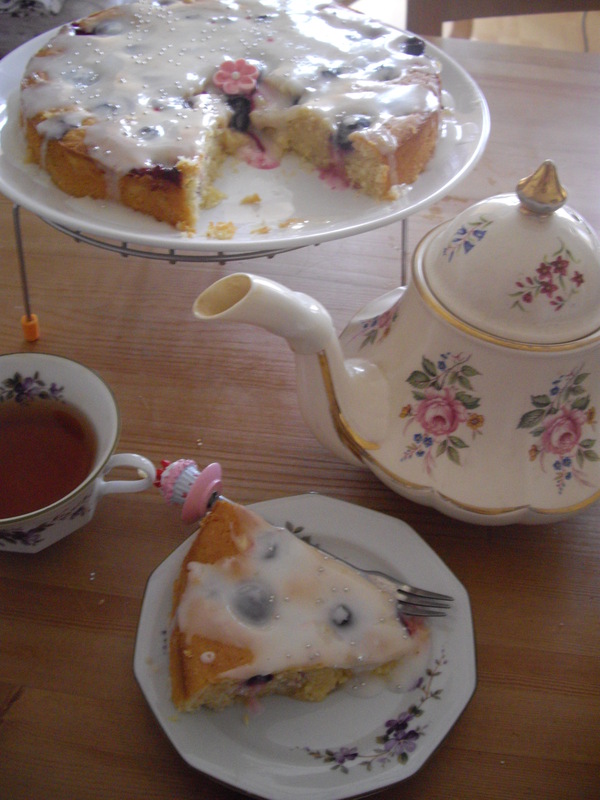 I adore lemon curd, and blueberries, and cakes made with Greek yoghurt. It’s summer here (although sometimes it appears that the Weather Gods didn’t see that memo); and so blueberries are fat and in season. A few weekends ago, I turned dozens of lemons into four bottles of lemon curd. 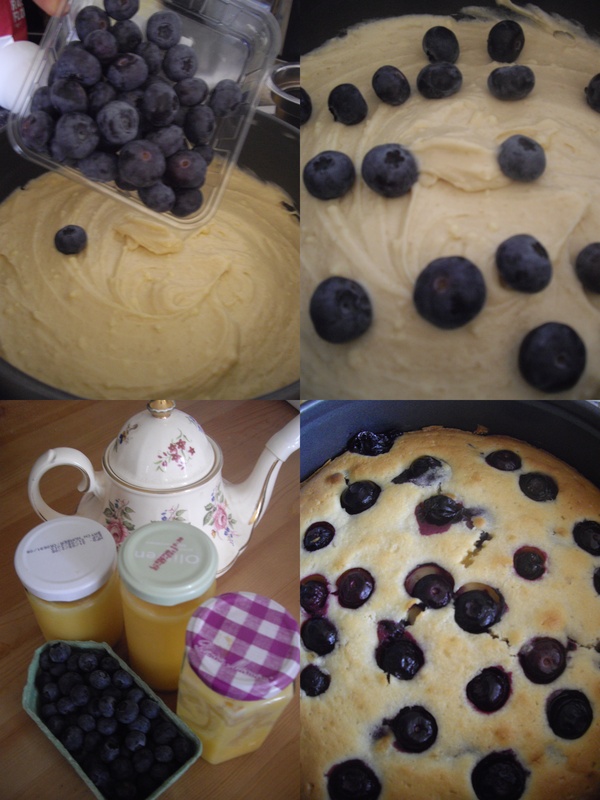 Looking in the fridge, then, it seemed only natural to use the excess lemon curd, blueberries, and rainy day, to create something glorious and summer-like: a Lemon Curd & Blueberry Cake. Pre-heat the oven to 160 degrees celsius. Grease and line whatever cake tin you have (my expat lifestyle at the moment means that I own one; this cake was not going to be a loaf cake for me). Place the yoghurt, lemon curd, flour, egg/s, sugars, and butter into a mixing bowl and quickly beat into a batter. Scrape half into a prepared tin. Sprinkle half the blueberries over the top; place the remainder of the batter into the tin; and sprinkle the remainder of the blueberries over once more. Bake for 1 hour 10 minutes or so, until it is golden on the top and a skewer pointed into the middle comes out clean. Cool entirely in the tin (I left mine for several hours as I got enough energy to go out for a movie). Once completely cool, tip out onto a serving platter and ice. To ice, mix together the icing sugar and the lemon juice, until you have a thick, smooth icing. Pour onto the cake and let the icing drift over the sides. 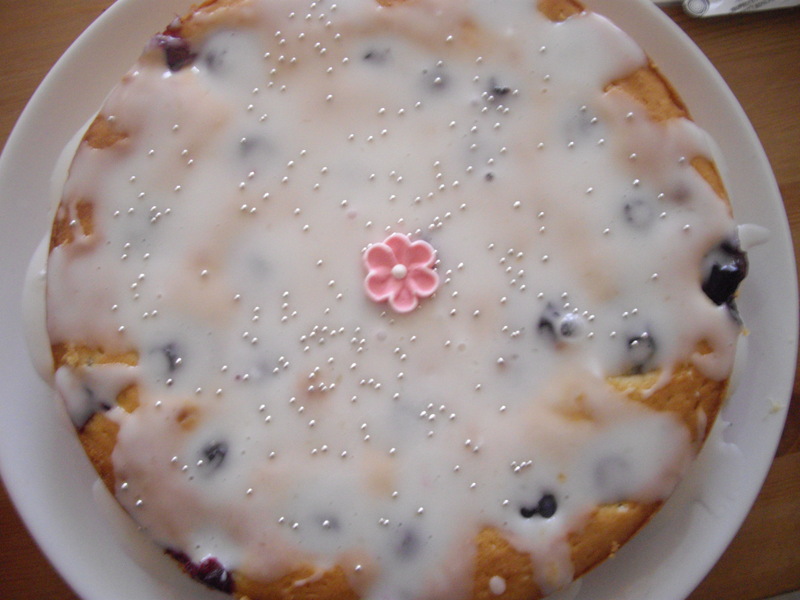 If you like, decorate either with edible flowers, or with icing-sugar flowers. It was the perfect rainy Sunday night dinner, with a strong cup of black tea to cut across the sweetness and acidity of the cake, and several episodes of The West Wing. 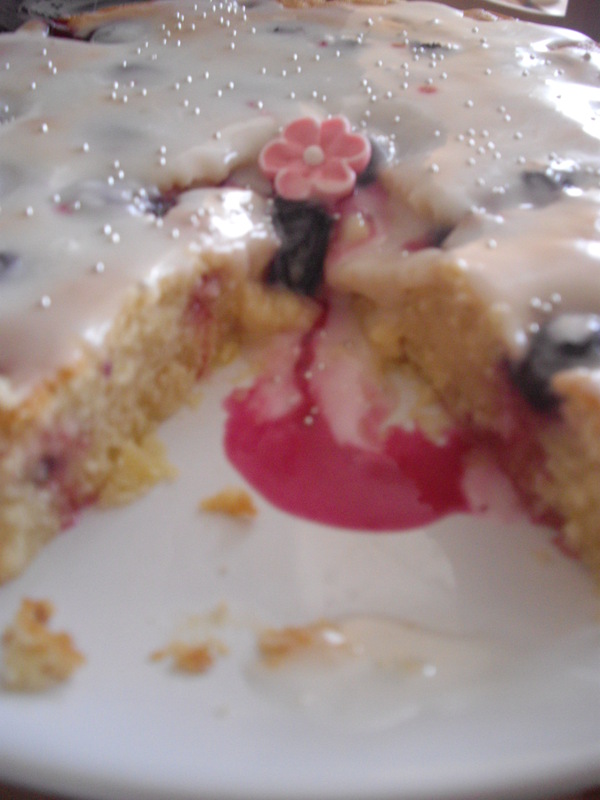 The blueberries ooze juice, and little by little, this spreads purple colouring into the cake. It was surprisingly and deliciously lemony, and I can definitely see the cake being served at a late spring/ early summer garden party.